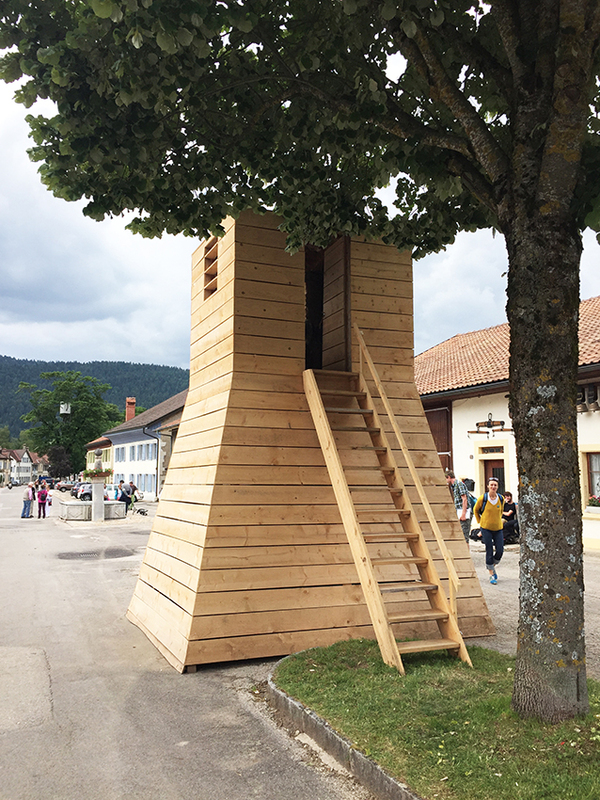 On the main road of Môtiers village, the artist Simon Beer installed a sort of hunting high seat. 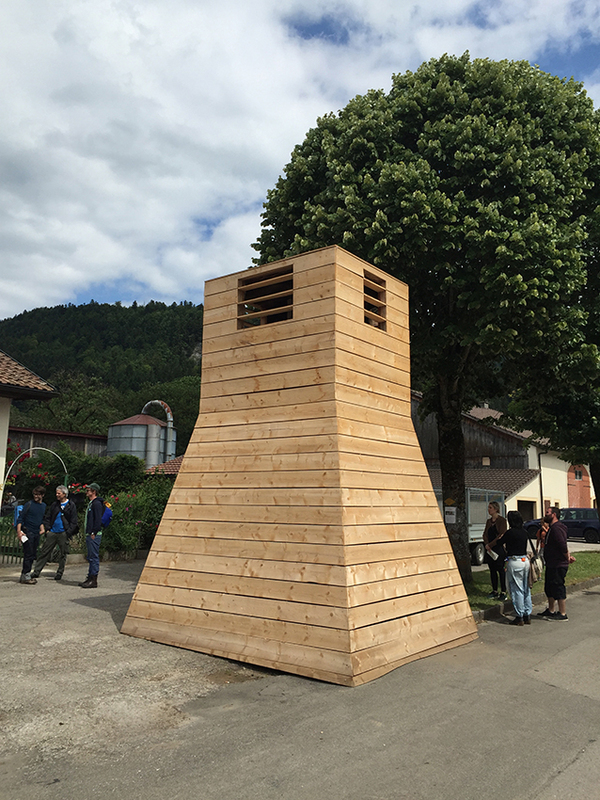 Similar to a fortress tower from the Middle Ages, this installation marks the entrance to the exhibition group called Art en plein Air. Moreover, the tower permits to controll the Grand Rue of Môtiers village. In fact, from the tower it is possible to observe half part of the village and even all visitors coming for the exhibition. The tower is furnished with a kind of Boudoir with 2 seats and an arrangement so you can lie down, like an intimate place where people can stay on there own, share discussions but also meet and invit someone for a new love story. At the same time, the visitors can see the different events which take place in the village. The opposite phenomen also exists : the visitors at the top of the tower are like sculptures observed from the village. 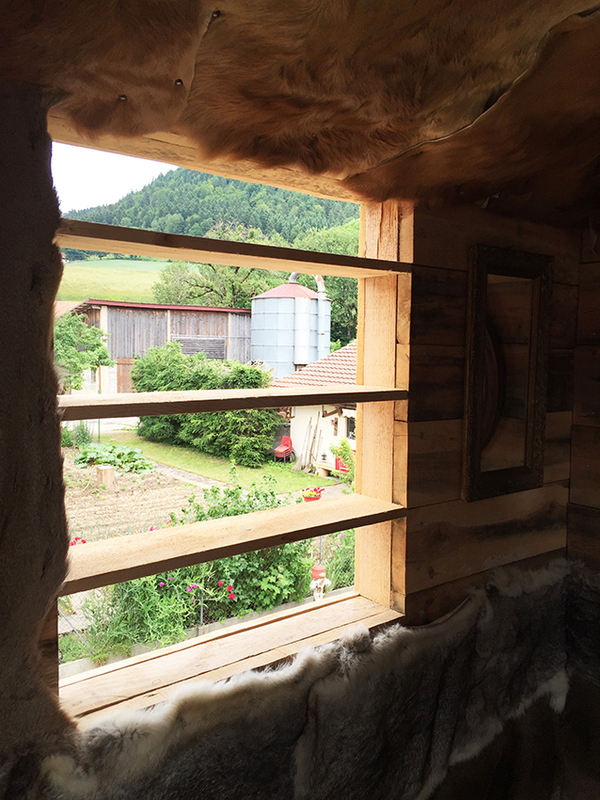 The Boudoir is equiped with animal skins which were killes during the hunting season 2014-2015 in Val de Travers. 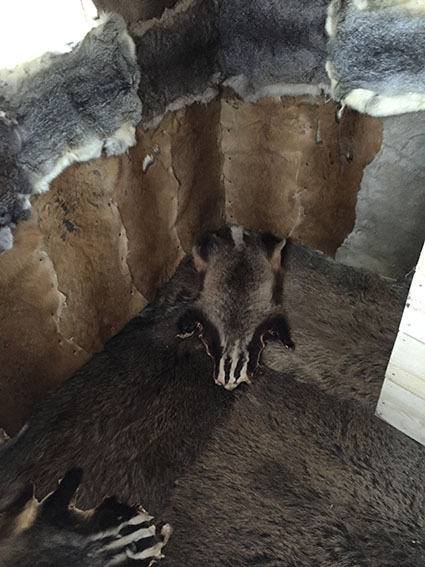 It concerns deer, badger, wild boar, chamois and rabbit skins. There were tanned and adapted to the floor, walls and ceilings of the Boudoir. Four mirrors, a crucifix and a holy water bassin complete the locus amoenus to have an absolute lockable discretion inside. Lateral view of the neighbor garden. 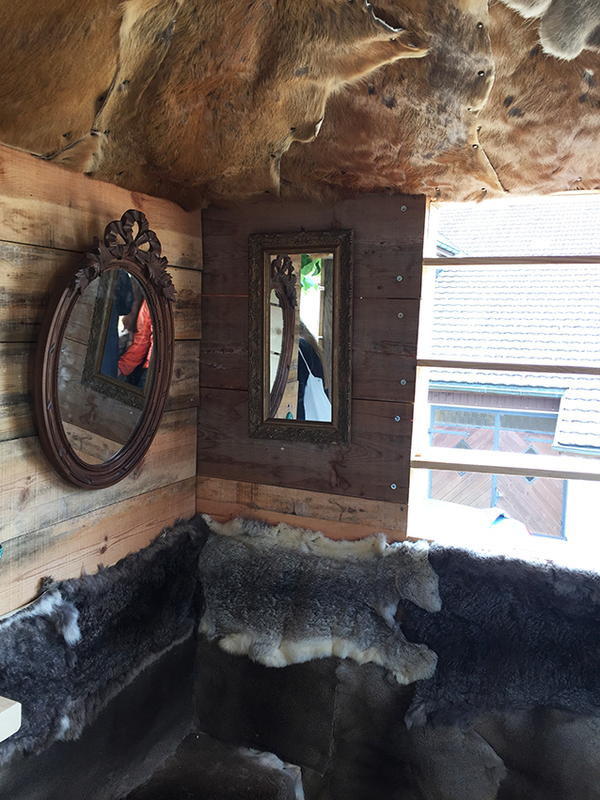 Interior with bench, animal skins and mirrors. Entrance of the Boudoir, in the background the Grand Rue. Detailed view of the floor with rabbit, wild boar, deer and badger skins. approx. 600 kg fir-wood incl. 70 different animal skins (deer, badger, rabbit, wild boar, chamois), 4 antique mirrors, antique crucifix, holy water.